Alcide De Gasperi (April 3, 1881 – August 19, 1954) was an Italian statesman and politician. He is considered to be one of the founding fathers of the European Union, along with the Frenchman Robert Schuman and the German, Konrad Adenauer. He spent 16 months in prison under Benito Mussolini (1926-1929). During World War II, he was active in the Italian resistance. Serving in Italy's first post-war Cabinet from June 1944, he became Prime Minister on December 10, 1945, and remained in office for eight years. He was provisional Head of State from June 12, 1946, until July 1, when Enrico De Nicola became the first President of Italy. He signed the peace treaty between Italy and the Allies in February 1947, then gave moral leadership to the Italian state as it recovered from the war. He did much to shape the post-war Italian state and is credited with leading efforts at reconstruction. Convinced that close ties between the European states would benefit all economically and help to maintain peace, he oversaw Italy's entry into the North Atlantic Treaty Organization, the European Community of Coal and Steel (which later developed into the European Union), and the Council of Europe. He was the second President of the ECCS's Parliamentary Assembly from May 11, 1954, until his death. De Gasperi was guided throughout his life by the social and moral teaching of the Roman Catholic Church, especially by the encyclical Rerum Novarum. He can be credited with helping to shape post-World War II Europe as well as his homeland. His vision of founding a European army to replace national military forces failed, however but his desire to unite the victors and the vanquished of the war in new, peaceful alliances has been achieved. A passionate advocate of freedom and justice, he stressed Christian values but believed that people of good will of whatever faith could work together. He has been declared a "servant of God" by the Catholic Church, an early stage in the beautification process, an honor afforded few other twentieth century politicians. He wanted to be remembered as a "man of faith" rather than as a "man of power." De Gasperi was born in Pieve Tesino, in Trentino, which as a result of the Napoleonic Wars had been part of Austria-Hungary since 1815. It is now part of the Province of Trento in Italy. His father was an officer in the Austrian Gendarmerie. He married Francesca Romani on June 14, 1922. They had four daughters. De Gasperi died in Sella di Valsugana, in Trentino. 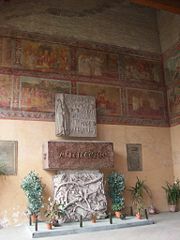 He is buried in the Basilica di San Lorenzo fuori le Mura, a basilica in Rome. De Gasperi attended high school in Trent and university in Vienna, studying philosophy and literature. He experienced financial hardship as a student and sometimes ate at the free soup-kitchen. At both school and University he was active in Catholic organizations. From 1901, he volunteered for the Federation of Catholic Workers' Societies, disseminating the ideas of Rerum Novarum. In 1905, De Gasperi defended his thesis on Carlo Gozzi (1720-1806), the Italian dramatist, and graduated from Vienna University. He then started to work as a journalist, becoming editor of a newspaper at the age of 24. Called La Voce Cattolica di Trento, he later changed to the paper's name to Il Trentino. Influenced by Romolo Murri, founder of the Christian Democratic movement inspired by Rerum Novarum, he became involved in local politics, successfully standing for the Trent City Council in 1909. In 1911, he was elected as Member of Parliament in the Austrian Reichsrat. In Parliament, he argued for Trent's return to Italy. As World War I began, his paper opposed Austria's participation. During the war, he frequently visited Rome pursuing the cause of Trent's reunification with Italy. He was also involved in assisting refugees through the Southern Refugees Assistance Committee. After the war, Trent was transferred to Italy. In 1919, De Gasperi—by then a citizen of Italy—was one of the founders, with Don Luigi Sturzo, of the Italian Popular Party, or Partito Popolare and from 1921, he was a Deputy in the Italian Parliament becoming President of the PPI Parliamentary Group. When the Fascist Party started to gain popularity, De Gasperi initially collaborated, arguing that by doing so the PPI might moderate its policies. However, following the murder of the anti-Fascist politician Giacomo Matteotti in 1924, and election abuses committed by the Fascists, he ceased to collaborate, joining with the leaders of other political parties to oppose Benito Mussolini. Mussolini, having engineered the 1923 law that gave two thirds of the seats to whichever party achieved a quarter of the popular vote had intimidated enough voters to ensure a Fascist victory in the election of April 1924. The following year, De Gasperi led a delegation to the King, Victor Emanuel III, begging him to take action against Fascist abuses, but the King refused to act. In 1926, De Gasperi and his brother, Augusto, were kidnapped by the Fascists and unofficially tried for treason. On this occasion, he was released, but on March 11, 1927, he was arrested, tried and sentenced to four years imprisonment. Following an appeal, the sentence was reduced to two years. After serving sixteen months, De Gasperi was released on parole, possible after the Roman Catholic Church had intervened on his behalf. From March 1929, he worked without pay in the Vatican Library, translating several books and writing as a journalist under various pen names. Between 1929 and 1943, he did not take part in politics. He was, however, involved in supporting the Italian resistance movement serving as President of the Committee of National Liberation from December 10, 1945. De Gasperi reemerged on the political scene in 1943, organizing the establishment of the first (and at the time, illegal) Christian Democracy party, or Democrazia Cristiana. When Mussolini was ousted in 1944, De Gasperi was appointed Minister without Portfolio in the new government led by Ivanoe Bonomi from June 1944 until December 18, 1944, when he was named Foreign Minister. De Gasperi remained Foreign Minister until December 10, 1945, serving from June 21, 1945, in the government of Ferruccio Parri. When the Parri-led government fell after several parties withdrew support, De Gasperi formed his first cabinet, becoming the President of the Council of Ministers, or Prime Minister on December 10, 1945. He retained the Foreign Ministry until October 10, 1946. Over the next eight years, De Gasperi led a succession of seven administrations as Prime Minister, again serving as Foreign Minister between 1951 and 1953, and as Interior Minister between 1946 and 1947. From June 12, 1946 until July 1, 1946, he was also interim Head of State during the transition from the Italian monarchy to the new Italian Republic. During this interregnum, he was also Regent, since Umberto II was technically king until the republican Constitution took effect. De Gasperi is the only man to have become President of the Council, Republic and Regent. The frequent changes in administrations (February 1947, May 1947, May 1948, January 1950, July 1951) resulted from the need for political alliances, given the large number of parties, none of which enjoyed enough support to gain an overall majority. His seventh government, though, consisted only of Christian Democrats. Determined to keep the Italian Communists out of his coalition, De Gasperi sought alliances with political partners whose policies, like this own, were broadly "centrist." He had to balance the concerns of his partners through astute ministerial appointments and making concessions. The biggest challenge was steering a centrist course between fiscal responsibility on the one hand (supported by those who wanted "small government" and a balanced budget) and heavy spending to help the less well off (advocated by those who wanted "large government" with less interest in reducing the national debt) on the other. Credited with Italy's post-war reconstruction, De Gasperi passed among other acts the Southern Italian Development Fund (Cassa per il Mezzogiorno) (1950), the Agrarian Reform (1950), and the Tax Reform (1951). He oversaw the construction of new power facilities, some of which utilized volcanic steam. The Agrarian Reform was especially significant, and attracted fierce opposition from within as well as from outside his own party. These reforms aimed to re-distribute land more fairly, taking some off the wealthy to give to the poor. However, he is perhaps more widely remembered for his Foreign policy. In September 1947, he signed the peace treaty between Italy and the victors of World War I. From the end of the war until his own death, he championed the cause of European unity, of world peace and was a strong supporter of close ties with the United States and of the Marshall Plan, despite opposition from the Italian Communist Party. He thought that the Soviet Union threatened democracy. With Robert Schuman and Konrad Adenauer, he was a founding father of the European Community of Coal and Steel, which subsequently evolved into the European Union. In 1951, he led Italy into the North Atlantic Treaty Organization. From May 11, 1954, he presided over the Common Assembly of the ECCS, the body that later became the European Parliament. He saw the purpose of the Community as building a peaceful and prosperous Europe. Which road are we to choose if we are to preserve all that is noble and humane within … national forces, while coordinating them to build a supranational civilization which can give them balance, absorb them and harmonize them in one irresistible drive towards progress? …It can only be done by establishing a meeting point where those experiences can assemble, unite by affinity and thus engender new forms of solidarity based on increased freedom and greater social justice. It is within an association of national sovereignties based on democratic, constitutional organizations that these new forms can flourish. It is essential for Europe to defend herself against a disastrous heritage of civil wars—the cycle of attack and counter-attack, of a desire for dominance, a greed for wealth and space, of anarchy and tyranny that has been the legacy of our history, otherwise so glorious. His dream was that Europe would become a community of ideals in that which mitigates against peace and unity, such as prejudice, fear, and resentment, would be abandoned. Nurturing this mentality was fundamental to the creation of a peaceful world. 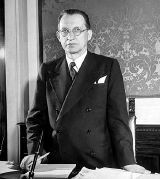 Committed to a common defense force, De Gasperi promoted the European Defense Community, which would have created a single military force for Europe in which no unit larger than a battalion would consist of troops from any one nation. This failed when the French Parliament voted against it in August 1954. It has been suggested that De Gasperi's own upbringing in a region where the border itself had shifted between states made him sensitive to the role that culture and national identity plays but that his experiences in Austria-Hungary also led him to believe in the possibility of supranationalism. When he sat in the Austrian Parliament, it represented a "great constellation of ethnic and national groups" and at that time considerable effort was being made in Austria-Hungary to "make a multi-ethnic system work … by the conditions for peaceful and civil coexistence among various religious and linguistic groups." Passionate about democracy and an enemy of totalitarianism, he also disliked religious dogmatism. On the one hand he was a staunch Catholic. On the other hand, he believed in collaboration on the basis of humanitarian values and worked with Protestants and Jews towards achieving his goals. On May 11, 1954, he told the members of the ECCS Common Assembly that "the Community … represents a new approach to safeguarding agreement on peace and co-operation through joint control of resources" continuing, "we must be guided above all by the overriding realization that it is essential to build a united Europe in order to ensure for ourselves peace, progress and social justice." In 1951, De Gasperi was awarded the LL.D. by the University of Ottawa. In 1952, he received the Karlspreis (engl. : International Charlemagne Prize of the City of Aachen), an Award by the German city of Aachen to people who contributed to the European idea and European peace. The ECCS has evolved into an institution close to what De Gaspoeri envisioned, although the failure of the proposed common defense force deeply disappointed him towards the end of his life. However, some of his visionary ideas have been implemented, including a European Central bank and a common currency, the Euro. Originally consisting of appointed MPs from the member states, the Common Assembly developed into a directly elected and therefore democratic European Parliament, representing the type of pan-European institution that De Gasperi had championed. The Alcide De Gasperi Foundation was named in his honor. The Foundation describes him as "father of the democratic reconstruction of Italy, advocate of European unity and of peace in security among nations" and aims to promote "strengthen democracy" and to "spread freedom." In 1953, Alcide De Gasperi founded the Institute of European Studies Alcide De Gasperi in Rome, serving as its first Director. There is a Rue Alcide de Gasperi in Luxembourg and a Via Alcide De Gasperi in Rome. There is also a 23 storied Alcide De Gasperi Building in Kirchberg, North East of Luxuebourg. There is a memorial in his honor in Trento, Italy. Declared a "Servant of God" by the Roman Catholic Church, he is considered as a candidate for beatification. His legacy is especially invoked by those who stress that Christian and humanist values informed the original vision of a unified Europe and beyond that of a unified world. His vision, though, was neither dogmatic nor exclusive but open and inclusive of all people. ↑ www.vatican.va, Rerum Novarum. Retrieved August 29, 2017. ↑ Joan Carroll Cruz, Saintly Men of Modern Times (Huntington, IN: Our Sunday Visitor Publishing, 2003, ISBN 1931709777), 30. ↑ Gianni Cardinale, Even Politicians Go to Heaven. Retrieved August 29, 2017. ↑ De Gasperi's Seventh. Time, August 20, 1951. Retrieved August 29, 2017. ↑ 5.0 5.1 5.2 Alcide De Gasperi, Address given by Alcide De Gasperi Consultative Assembly of the Council of Europe, December 10, 1951. Retrieved August 29, 2017. ↑ Paolo Mattei, De Gasperi and Europe. Retrieved August 29, 2017. ↑ Alcide De Gasperi, Speech on the occasion of his election to the Presidency of the Common Assembly of the European Coal and Steel Community, Strasbourg, May 11, 1954. Craveri, Piero. De Gasperi. Bologna, IT: Il Mulino, 2006. ISBN 978-8815114181. Keyserlingk, Robert Wendelin. Fathers of Europe: Patriots of Peace. Montreal, CA: Palm Publishers, 1972. ISBN 978-0919366183. Prati, Giulia. Italian Foreign Policy, 1947-1951: Alcide De Gasperi and Carlo Sforza Between Atlanticism and Europeanism. Göttingen, DE: V&R Unipress, 2006. ISBN 978-3899713015. Samuels, Richard J. Machiavelli's Children: Leaders and Their Legacies in Italy and Japan. Ithaca, NY: Cornell University Press, 2003. ISBN 978-0801434921. Sassi, Salvatore, and Adolfo Sassi. Alcide De Gasperi e il periodo asburgico. Saggistica Aracne, 76. Roma, IT: Aracne, 2007. ISBN 978-8854811386. Venneri, G. "Man of faith and political commitment: Alcide De Gasperi in the history of Europe." Journal of Modern Italian Studies. 13(1) (2008):89-92. All links retrieved August 29, 2017. Biography at the Italian Ministry of Foreign Affairs. Article on De Gasperi's idea of Europe. History of "Alcide De Gasperi"
This page was last modified on 29 August 2017, at 16:03.